Our loyalty cards are printed on 400gsm uncoated card stock so you can write your stamp your customers loyalty card or write on it with a ball point pen. 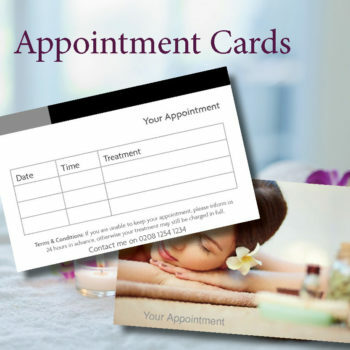 These cards can also be used for voucher cards and appointment cards. With the option to gloss or matt laminate on the front of the card. These short run cards are digitally printed, double sided with the option of gloss or matt lamination to the front. For print runs above 1000 cards please contact us for a competitive bespoke print quote.